Refrigerant recovery may not be the bane of every HVAC technician’s existence, but it is a nuisance. But it’s also vital to your customers. No matter where you’re located, they’re depending on you to keep temperatures at an optimal level. But refrigerant recovery isn’t solely about keeping your customers comfortable. It can present a serious health and environmental hazard, as refrigerants and other airborne chemicals can easily cost them thousands of dollars in untold fines. And if your customer base also happens to include work in which temperature sensitivity is vital, it can play a devastating role in operations and ruined merchandise. But which recovery units are truly the best? We took a look at some of the top sellers and narrowed it down to four. Infinicon’s previous Vortex models may have been unparalleled in their power and capability, but the Dual model introduces a whole new level of portability, function and compact size. 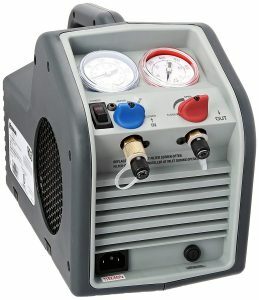 Complete with a 1 HP dual piston compressor for rapid recovery speeds, this unit also includes a micro-channel condenser to lower discharge pressure. A versatile and compatible model; even for the most pressing conditions. 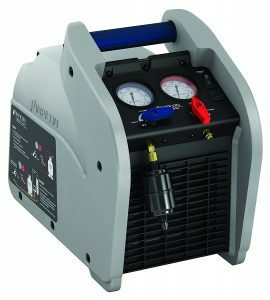 Robinair combines portability with power, providing superior capacity to recover most CFC, HFC, and HCFC refrigerants; including R-410A. A unique cross flow design features a condenser layout optimized for shorter cycle times and a safety shut-off switch automatically shuts off machine if pressure rises above 550 PSI. 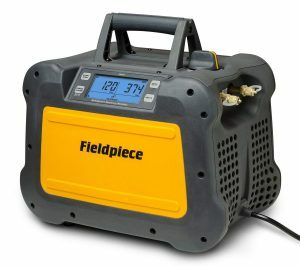 With a waterless-resistant twin cylinder compressor to withstand rain, this unit is capable of frictionless performance and a guaranteed long life no matter what the condition. Even more unique is the powerful micro-channel condenser which compresses more refrigerant 3-300 RPMs and 1 horsepower in comparison with competitive models. Design certified to meet SAE J2810, MASTERCOOL provides superior and quiet performance with pressure readings in PSI, BAR, and MPA. All the A/C Recovery System units are pressurized up to 350 psi and are leak and performance tested for quality control purposes. Each model comes complete with a recovery unit, a DOT tank, a 60” service hose, 72” conversion hoses and UL approved high and low side R134a manual couplers. 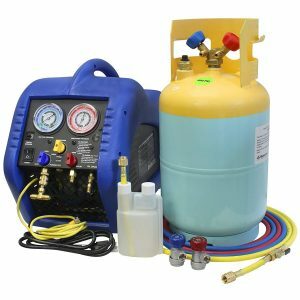 Refrigerant Recovery Machine Buying Guide – How to find the best refrigerant recovery machine for your needs! Unlike many other technical jobs, HVAC requires various level of hard to reach and often highly complex units; both indoors and outdoors. Naturally the question of portability pops up. Here’s the dilemma. Frequently, more portable models lack the power of larger models; particularly those which are designed for time-critical rapid recovery. So if your customer base tends to be large industrial firms, portability is nowhere near as important as speed and comprehension. Adjust your needs and preferences accordingly. Unfortunately, it also means the general rule that larger sized models are sometimes more cost prohibitive. But if it’s a need your business demands, it’s a small investment to make considering the long term return. Twin cylinder units are generally considered to be the most effective for large scale needs, and if you find that rapid response time is critical to your business it would be wise to examine the models available. The above listed examples have the benefit of being twin cylinder powered. Technically, this should be a no-brainer. But it’s not so simple. You may be tempted to purchase a model proclaiming a lifetime warranty, only to discover that the unit is ineffective and weak. Conversely, a limited warranty may not be capable of answering new (and frequently complex) changes in environmental hazard laws; which means an unwarranted waste of money. But a truly durable model should be capable of lasting you several years, whether you choose an extended warranty or not. An added bonus is that many manufacturers and distributors now currently offer after sales support, which can be a life saver in emergencies where time is of the essence. Where cash literally is king, there’s no getting around the issue of cost. When vendor offerings can fall into the $600-$700 range even for mid-end models, you’re going to need to take your own budget into consideration first. Consider long term factors. Will that $900 system prove more effective? Will it protect your customers from EPA violations? How often do you plan on using it? Is it necessarily any more effective for your typical jobs than the $400 model? These are questions only you can answer, unfortunately. Ultimately, refrigerant recovery is a question of long term relief and safety. Look at the bottom line. Are you willing to sacrifice your customer’s peace of mind for convenience – or are you looking for efficacy and performance? For professional reasons, let’s hope it’s the latter.